One of the best ways to experience a country’s culture is through tasting their food. Enjoy a flavorful Vietnamese feast at Bawai’s Vietnamese Kitchen. 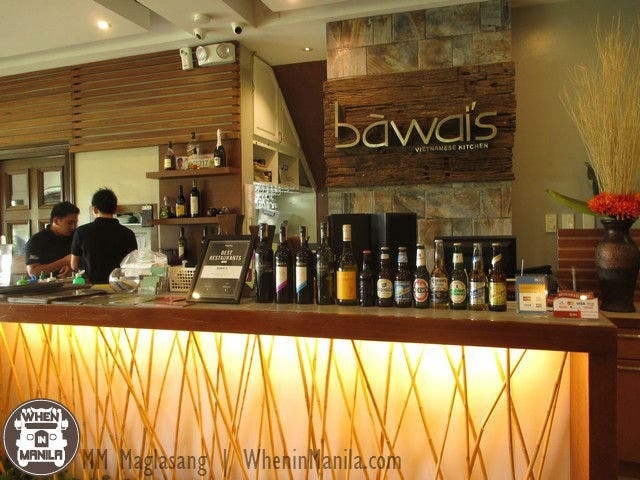 Bawai, which means maternal grandmother in Vietnamese, first opened in Tagaytay a couple of years ago. Tucked within a quiet location along a perennially busy Katipunan Avenue, Bawai’s Manila branch stays true to the original design and aesthetic of its tranquil Southern location. The entrance area of Bawai’s Vietnamese Kitchen is a modest oasis with lush greenery and vibrant florals. Bawai’s Vietnamese Kitchen is perfect for intimate gatherings and meals. Their selections are generally good for sharing for 2-3 people. At approximately Php 250 per pax, you can already enjoy a full course meal. This is a refreshing way to start your meal: fresh and crisp leafy greens, plump shrimp, and juicy pork slices all wrapped in a fresh roll perfectly paired with their sweet peanut sauce. I love the way the spices and the sweet tamarind tang lingers in your taste buds. Aromatic and savory, every bite of the prawns is a delicious burst of exotic Vietnamese flavor. The com suon cha was the piece de resistance of our table, with its soft and tender succulent meat filling our mouths with full-bodied lemongrass flavor. Just as juicy as our local liempo, although the skin isn’t cooked crispy. Definitely one of Bawai’s must-try dishes. What’s a Vietnamese feast without pho? Of Bawai’s noodle soup selection, the pho bo is their bestseller with tender beef, perfectly cooked noodles, and an infusion of herbs and spices all swimming around a bowl of yum. 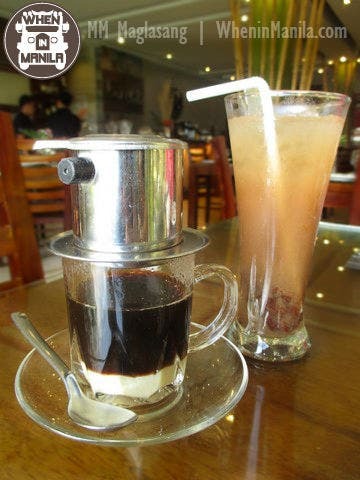 The ca phe sua nang is a perfect combination of strong and sweet, without being too saccharine. This is one of the best cuppa joe’s I’ve ever had thus far and it had a smooth silky quality to it. The sweet tamarind drink, on the other hand, doesn’t taste like the usual tamarind candy we have; it’s not too sweet and not too sour and it pairs well with all the dishes we tried. The sticky sweet cake with creamy coconut milk is dessert perfection. It sticks to the insides of your mouth, making you crave for more servings. Decorations and zen accents that adorn the restaurant lend much artistic appeal to Bawai’s Vietnamese aesthetic. A few tables are placed outside the restaurant for al fresco dining. The earthy tones of the restaurant provide a natural and calming ambiance. Bawai’s is a highly recommended venue to host your next family gathering, or event such as baby showers and christenings, bridal showers, among others. Feel right at home when dining at Bawai’s Vietnamese Kitchen and discover one of Tagaytay’s best kept secrets at this Northern Manila hideaway. Open everyday from 11:00 a.m. – 2:00 p.m. and 5:00 p.m. – 10:00 p.m.
MM is a tiny adventurer, avid reader, movie aficionado, introvert extraordinaire, and life enthusiast. Sugar is her only vice. Loves beaches, garden parks, and intellectual conversations. Inadequate with small talk.